Global warming or climate change has been a topical issue on the world’s headlines today irrespective of country differences. Climate change which is basically changes in the composition of the atmosphere has no doubt raised more questions than answers. Whiles a school of thought has provided evidence of climate change and the expected or projected dire consequences, another school of thought (skeptics) have rubbished the whole climate change as – over – exaggeration, virtually perceiving it as “much ado about nothing”. Personally, I think the effects of climate change are real. Here in Ghana, we have stories and evidences of the effect of climate change such as drying up of water bodies like River Pra and River Densu; changes in rainfall patterns; heat waves; sea level increase washing or eating away roads and so on. 2. Mitigation – that is, minimizing emissions of greenhouse gases and move towards a low-carbon economy. In adopting these global plans in principle, nations are expected to initiate, develop and consciously promote climate change action plans. Governments, policy makers or leaders must therefore ensure to take actions that are relevant, appreciated and understood by the target audience (citizens). It must be indicated that a practice that may be highly embraced in a country or culture may be frowned upon and totally rejected in another setting. For instance, one of the reasons why “Ghana @ 50” toilet project failed was because the organizers did not understand the sociological or anthropological setting of the targeted audience. It is common to find husband and wife defecating along the beaches and whiles “doing their own thing” they engage in face-to-face conversation as they enjoy the cool breeze. The toilet facility had divided closets barring physical contact which is highly practiced in other developed countries. Indeed, indigenes prefer to defecate around the facility whiles upholding their social interaction culture. This requires the attention or input from Applied Anthropologists. Applied Anthropology is basically branch of anthropology that concerns itself with planned cultural change and the solution of practical problems. Indeed, very laudable and great developmental plans which took time, resources, energy to develop have not succeeded. Transforming such plans from the drawing board onto societies or communities has been met with rejection and neglect. Paradoxically, Africa has been labeled as the most endangered to the effects of climate change though the continent contributes a minute percentage of greenhouse gases emissions. Efforts are been made on how Africa can be supported to handle these crises. But the question is will Africa be expected to adopt universal programs or have the opportunity to generate peculiar programmes? With a whole number of people in African societies or communities still caught in the primitive way of life, inter-cultural and intra-cultural differences must be acknowledged. For instance, a native or primitive farmer who observes changes in rainfall patterns as a threat to the livelihood of his family can easily conclude that the gods are displeased granting that superstition is strongly held. He will therefore seek the intervention of the fetish priest who after some doing some shake ups interspersed with uncalculated steps will spew out inhuman words. Eventually, a goat may be required as a sacrifice to appease the gods. Until such individuals are really oriented on climate change, they will render the programme unsuccessful. As already indicated, schools, boreholes, pipe borne water facilities, clinics, toilets and so forth have been erected in communities to enhancing their livelihood but these structures have only become statutes. For instance, if boreholes are constructed for natives and they are not trained on how to manage or maintain the facilities, the latter will soon live out their relevance. In the light of political leaders, governments, policy or decision-makers, development partners are preparing to embark on climate change programmes, they must engage the services of applied anthropologists to ensure not only the success of the programmes but their sustainability. - whiles requesting for consumer behaviour changes pragmatic alternatives must be provided. Man has been endowed with the power, ability, skills or dominion to govern the world as illustrated in the book of Genesis. Man therefore from the days of Adam has manipulated nature (or natural elements) with such authority to make the world what it is today. God delivered a simple but important task to Adam in the Garden of Eden – to dress and keep it! Has Man lived up to this responsibility? Whiles we applaud humans for their display of ingenuity, creativity, innovation in the name of development through philosophical, scientific and/or technological concepts or ideas, we seem to neglect the negative effects of our actions on nature. Trees or plants have drastically been hewed down; water bodies are increasingly becoming vulnerable; animal species are dying out and becoming extinct and so forth. The massive exploitation of Nature by Man since creation has incurred the displeasure of Nature. Today, weather patterns have changed dramatically to the detriment of peasant agriculturalists that depend on small scale farming for their livelihood. On the larger scale, developing countries who are predominantly agriculturally-based economies are been badly affected thereby threatening the achievement of the Millennium Development Goals (MDGs) with respect to the eradication of poverty. Storms, sea surges, hurricanes, volcanoes, heat waves, changes in precipitation, high sea levels and so on have place human life under danger. Nations or cities have been torn apart by hurricanes; villages have been sub-marine by high sea levels; earthquakes have ripped through land territories leaving behind unquantifiable volumes of disaster. And indeed, these phenomena seem to be endless. Can it be attributed to Nature speaking? Interestingly, humans to ensure their own safety and security have enacted various policies or laws in the name of human right – right to live; right to information; freedom of speech; right to basic amenities etc -. In the event of having one’s rights violated, the victim aggressively screams for his/her rights to be respected and stretches towards the arms of the law for justice. Even 3rd parties (advocates) take it upon themselves to fight for the right of the marginalized, disenfranchised or the weak in society. But who speaks for Nature? Indeed, I must acknowledge that some individuals, groups or organizations have made frantic efforts to speak on behalf of Nature. Examples of such bodies are Friends of the Earth and Wide life society. Arguably, these bodies have do not have the power to halt damages dished out to Nature regardless how much and hard they wail. It depicts a typical village where women may weep and cry against certain cultural practices but dare not question the authority of their husbands or rulers. If Man can’t dress and keep Nature, then it’s logical that nature should speak for itself. Unfortunately, Nature does not react in a friendly manner. All the natural disasters we are engulfed with are the “fighting-back” campaign of Nature. According to the law of consequentialism – the rightness and wrongness of an action are determined by the consequences of the action. By this inference, all the natural disasters we are experiencing are due to our consequences of our actions on Nature. Man is now at the mercy of nature as any change in the latter has inevitable consequences on the former. 2. To respect and uphold the rights of Nature – right to live and right to be preserved. Youth-in-Action on Climate Change: A Necessary Effort! Climate change has gripped all aspects of the world’s developmental agenda today. The issue has become so critical that world leaders hardly meet without deliberating on it. It has widely been publicized and accepted that the effects of climate change on mankind are inevitable. It has now posed as a vicious threat to the world’s survival or sustainability. This alarming situation prompted world leaders (both from developed and developing economies) to hew out some instruments such as the Montreal and Kiyoto Protocol under the watch of UN Framework Convention on Climate Change (UNFCCC) that primarily is seeking to commit nations into reducing emissions of carbon dioxide significantly. The Copenhagen conference held in December last year under the auspices of UNFCCC on climate change was envisioned to bury all differences and forge ahead with common goals. Indeed, some countries (especially from the developing countries) expressed their disappointment on the unwillingness of some developed countries to reduce carbon emissions at a significant rate. Whiles some strides were made at the conference, one may ask: was the event really successful? Whiles our world leaders are conferring among themselves in combating climate change, the involvement of young people must not be overlooked. In any case, the dire consequences of climate change shall be experienced by the youthful generation either presently or in the near future – there’s no escape route – even in the light of mitigation and adaptation plans or strategies. The youth possess strength, energy, talents, or resources that should be harnessed, nurtured and directed in the fight against climate change. Admittedly, some efforts have been made by a number of key institutions such as the World Bank Institute and British Council in training young people on climate change. Pockets of youth individuals and groups have emerged also enhancing and championing the climate change agenda. Though, these are welcomed and highly appreciable, more need to be done especially by governments of developing nations. 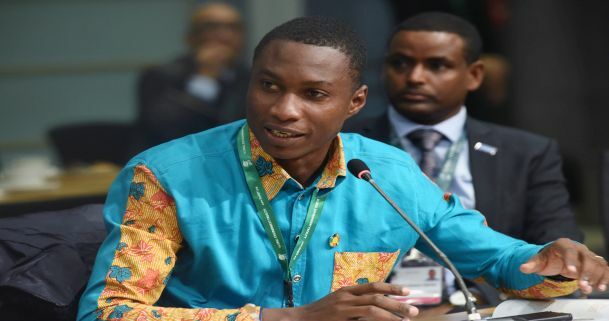 In Ghana forinstance, the government has engaged 25,383 young people in its Youth-in-Agric Business module of the National Youth Employment Programme (NYEP) according to Ghana’s 2007 Annual Progress Report (APR). Though, this is a laudable approach in dealing with the mass unemployment problem among the youth, how are these young people educated on climate change so they do not perpetuate old agricultural practices that are detrimental to the environmental. Methane gas is emitted from agriculture which contributes to 20% of the greenhouse gases. a. Information – where young people are educated on climate change, that is, what it is; its effects; what causes/is causing it; methods of controlling it etc through a massive awareness drive. b. Engagement – where young people are seen as key stakeholders in the planning and decision-making processes on environmental issues including climate change. Undoubtedly, engaging young people is a necessary effort in the fight against climate change as it will guarantee sustainability of any initiative and/or programme on climate change. As tomorrow’s leaders, they will be better armed and equipped with the skills, expertise, knowledge, or abilities to keep the effects of climate change under control. Youth inclusion on the climate change agenda should be unreservedly promoted.